Druids are my favorite and first played class. This is because of their huge versatility that allows you to do just about anything you want; whether it be tank, heal or DPS (melee DPS/ranged DPS), you will even be able to outshine the other classes (most people say Druids do good in all roles, but aren’t the best at any of them – I disagree). 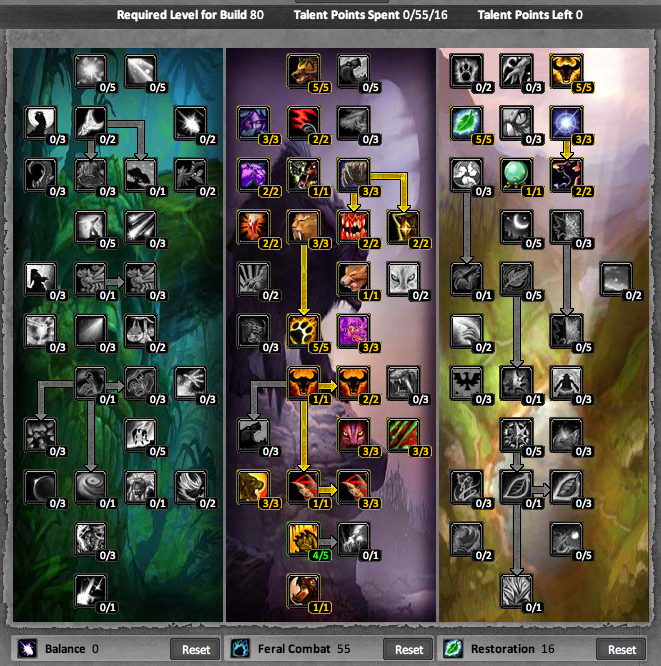 In this guide I will focus on leveling a feral druid effectively and efficiently, including: rotations, talents, heirloom gear and general tips among other things. Level 10 – 19 is an exception. You CAN take the slow bear grind route and not have to worry about a respec later (not really a problem on most realms) or speed up the process with Balance leveling for 10 levels (I recommend Starlight Wrath – 5/5, Moonglow – 3/3 and Nature’s Majesty – 3/3). To do this you will need to also invest in Intellect gear and heaps of water. Always take the weapon and gear with the best stats. Make sure to keep Mark of the Wild and Thorns refreshed before pulling. – Make sure to keep your Mark of the Wild and Thorns refreshed at all times. – Cast Wrath from max range and when the enemy reaches you, proceed with melee. – When you obtain Moonfire use it once (and *once* only) after opening with Wrath (only if it is worth the mana). – When you obtain Entangling Roots, use it after the opening Wrath. Then proceed by applying Moonfire. Do not worry about breaking the roots. – Use a staff (or other weapon) with the highest DPS available, as you don’t have any forms yet. Rotation: Wrath from max range and then root the enemy (Entrangling Roots). Apply Moonfire if it is worth the mana, then continue spamming Wrath until the enemy reaches you, then proceed to meleeing it to death (if it isn’t dead already, that is). Make sure Mark of the Wild and Thorns are applied at all times. -Use Wrath and then quickly apply Moonfire (if you need/want to range pull). -Transform into Bear Form, use Demoralizing Roar and then keep on using Maul whenever possible. -If you end a battle with over 20 rage and enough HP, pull the next enemy with Growl and continue without shifting out. Rotation: Wrath from max range and then apply Moonfire if you need to range pull. Transform into Bear Form, use Demoralizing Roar and then use Maul whenever possible. -Use Prowl and stealth behind the enemy (if you need to range pull, do this with Faerie Fire (Feral) or Moonfire). -Open with Ravage once you learn it and when you learn Pounce use the later mentioned instead. -If you opened with Pounce use Shred before the stun runs out (sometimes you should use Tiger’s Fury and then Shred again). -Apply Rake if you have it. -Use Claw until you have 5 Combo Points. -Use Ferocious Bite (or Rip if the fight is going to last longer). -You can activate Tiger’s Fury at any time when you need extra energy and or damage. -If the target(s) is (are) not dead, reapply Rake and continue the cycle from there. Rotation: Transform into Cat Form, Stealth behind the enemy (or use Feral Charge) and open with Pounce (then Shred if you have 2/2 Shredding Attacks); Ravage if you do not have Pounce. Use Faerie Fire (Feral). Apply Rake and use Claw until you have 5 Combo Points. Use Ferocious Bite or Rip if you do not have it and activate Tiger’s Fury. If you are facing multiple enemies let the first target bleed to death while starting the cycle from Rake on the next enemy. -Instead of using Claw until you have 5 Combo Points, use Mangle. Rotation: Transform into Cat Form, Stealth behind the enemy (or use Feral Charge) and open with Pounce (then Shred if you have 2/2 Shredding Attacks). Use Faerie Fire (Feral). Apply Rake and use Mangle until you have 5 Combo Points. Use Ferocious Bite and activate Tiger’s Fury. If you are facing multiple enemies let the first target bleed to death while starting the cycle from Rake on the next enemy. -You do not always need to start a battle stealthed (it is highly recommended though). -When you are fighting multiple enemies use Savage Roar. Rotation: Transform into Cat Form, stealth behind the enemy (or use Feral Charge) and open with Pounce (then Shred if you have 2/2 Shredding Attacks). Use Faerie Fire (Feral). Apply Rake and use Mangle until you have 5 Combo Points. Use Ferocious Bite and activate Tiger’s Fury. If you are facing multiple enemies, use Savage Roar after the opening, apply bleeds and let the first target bleed to death and start the cycle from Rake on the next enemy. – Always keep Mark of the Wild on everybody and Thorns on the tank. – Save your Rebirth for if when the tank or healer falls during a boss battle/script. – Learn to switch roles in battle, especially when you are DPSing. Off Tanking and even Off Healing can be both done just as well with this spec while leveling (healing up until Outland). – Consider putting together a healing gear set for when you are called to heal in the Outland and beyond. Just look for leather and cloth will spell power and intellect. – If you need to heal, simply shapeshift out into Caster Form and cast Rejuvenation and Lifebloom; the HoT’s (Heal over Time) from these two instant cast spells will outweigh the DPS of any solo mob + Lifebloom has a special extra healing after it runs out or is otherwise « taken away » from you (with a purge for example). If you are dangerously low on HP, use Regrowth before these spells. – If you can’t get the heal off, use Nature’s Grasp for an instant root and back away about 10-25 yards, or use Barkskin in order to not be interrupted – or both. – To help with healing in the middle of a battle, either transform into Bear Form and use Bash or cast Nature’s Grasp and move away after the enemy has been rooted. – When killing a tough mob/elite, first cast all three HoT’s (Regrowth, Rejuvenation and Lifebloom) on yourself, transform into Bear Form, cast Barkskin and use Feral Charge. – Skinning and Mining are the best options money-wise and give nifty buffs to HP and Crit as well. – Herbalism and Alchemy are also good professions for a Druid should you wish to stick within role-play boundaries or wish to have a production profession. There is a lot of money in « Alchemy-market » as well. – Skinning and Leatherworking are the best choice if you like to create your own gear, but most of the gear Druids will use from Leatherworking is BoE anyway, so I would leave this to the shamans, hunters and rogues. As a Druid you have multiple options for a dual spec. It is worth picking up dual spec at level 40 if you have a main to fund it; 1000g at level 40 is pretty expensive for a first time player. – A Resto dual spec will allow you to heal instances while leveling more easily; especially if you have some caster gear. 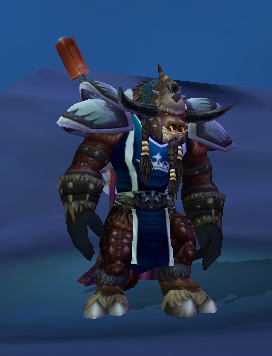 – A Feral (Tank) dual spec will make tanking slightly easier in Instances and let you try AoE Bear Grinding. – A Balance dual spec will give you the possibility to level in a different way and take a break from Feral when you want to. – A PvP dual spec will make battleground « leveling » (battlegrounds do not give experience on Molten-WoW) much easier and enjoyable. On PVP-Realms (all Molten-WoW ones included), this can also help with the « social aspects » of the game that you might perform with the other faction members you find on your adventures. Look for stats in the following order: Agility > Stamina > Strength > Critical Strike > Attack Power > Intellect. 1. Agility: Needed for Crit, Armor and Dodge. Also gives Attack Power in Cat Form ( 1 AGI = 1 AP in Cat Form ). 2. Stamina: Needed for Health. 3. Strength: Needed for Attack Power ( 1 STR = 2 AP ). 4. Critical Strike: Needed for increased Crit chance. 5. Attack Power: Needed to increase raw damage. 6. Intellect: Needed for Mana for emergency heals and transforms. ***Swift Flight Form can be trained at level 71 but the quest is still worth doing if you have the time to unlock Anzu. – Bad Kitty – BadKitty is a debuff tracker for Feral Druids. It now tracks all buffs, debuffs, and cooldowns, which are very important to every cat (and bear) who care about their damage output.